Anna and Steven would like to welcome you to Claremount House, their purpose built, family-run Bed and Breakfast. This charming B&B sits just down the promenade from Salthill and has panoramic views of the Galway Bay Golf Course. There is free on site parking. This is a non-smoking establishment. Coach tours of the area run daily and guests can be collecte from right outside the house. The rooms at Claremount House Bed and Breakfast are bright and spacious. All rooms are en-suite. Each room features top of the range beds with goose down duvets, pillows and large deluxe soft towels. Breakfast is cooked to order by Steven each morning. Guests can enjoy their morning meal while looking out across the Atlantic Ocean from the dining room. Galway City is just 2km away and is home to a host of cafés, diners, restaurants and pubs. Whether you are looking for traditional local food or more exotic cuisine, Galway will provide something for all tastes. 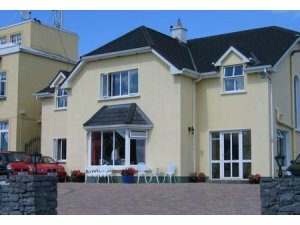 Claremount House Bed and Breakfast is situated along the main Salthill promenade, up the road from Leisure Land. The guesthouse overlooks the fourth tee on Galway Bay Golf Club and is convenient to Galway pubs, music, restaurants, theatres, cinema, art galleries, Salthill aquarium, tennis, windsurfing, fishing, horse riding, driving range and more. Salthill is one of Ireland's most popular holiday destinations, and boasts blue flag sandy beaches among main attractions.